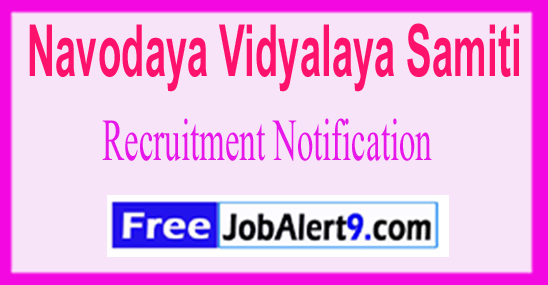 Navodaya Vidyalaya Samiti (NVS) Issued a Advertisement For Recruiting 683 Stenographer, LDC/Storekeeper, Audit Assistant.All Eligible and Willing candidates Can Check Detailed Advertisement From Their Official Website And Apply Online On Or Before 20th December 2017.Eligible and Interested Candidates Can Check Detailed Information For Each Postion Such As - Eligibility Criteria, Qualifications, Age Limit, Selection Procedure Before Applying. Educational Qualification - Candidates Must Pass 8th/10th/12th/Diploma(Nursing) Graduation Degree(B.com,B.sc)Post Graduation Degree or its equivalent qualification from a recognized Board / University. Selection Procedure - Computer Test,Skill Test,Trade Test. How To Apply - All Eligible candidates may fill the online application through official website http://www.nvshq.org. After successfully submitting the application, candidate must send hard copy of application along with relevant testimonials to the following Address before or on 20-12-2017. Important Dates -Last Date for Registration of Online Application Form Is: 20-12-2017 . Click Here For NVS Recruitment 2017 Detailed Advertisement. NVS (Navodaya Vidyalaya Samiti) Has Released Recruitment Notification For 351 PGT, TGT, Faculty Posts. All Eligible And Interested Candidates Can Apply Offline.Further Detailed Information Regarding Educational Qualifications, Age Limit, Selection Procedure, Exam Pattern, Syllabus for NVS (Navodaya Vidyalaya Samiti) Recruitment 2017 - 351 PGT, TGT, Faculty Post is mentioned below. Candidates age should be between 21 to 62 Years As on (15-06-2017). Age relaxations will be applicable as per the rules. Candidates should have done Graduation Degree / Post Graduation Degree / Engineering Degree or its equivalent qualification from A recognized university. All Eligible Candidates will Be Selected Based on Their Performance In Inter-view . Rs. 27,500/- & Rs. 32,500/- (Post 1), Rs. 26,250/- & Rs. 31,250/- (Post 2), Rs. 26,250/- (Post 3) . All Eligible & Interested candidates Can Download application Form through official website (http://www.nvsropune.gov.in). After Filling The application form, candidate must send by hard copies of application along with relevant testimonials (Mentioned In Detailed Advertisement) to the following Address before / (15th June 2017). The concerned Jawahar Navodaya Vidyalaya . Closing Date of Application Form Is - 15-06-2017. Click Here For NVS Recruitment 2017,Advertisement.